Explore Croatia in this stunning luxury itinerary that takes you to Dubrovnik, Split and the beautiful rural setting of the Plitvice Lakes. Well known for being the setting for Game of Thrones, you’ll visit some of the iconic locations whose natural beauty acts as the backdrop for much of the epic television programme. You’ll also stay in our handpicked luxury properties, where you’ll have the chance to explore the very best that Croatia has to offer. Arrive into Dubrovnik where you’ll check into the luxurious Pucic Palace for three nights. This establishment is conveniently situated in the heart of Dubrovnik’s Old Town, next to the limestone-paved Stradun. The East West Beach Club, one of Europe’s top 5, is just 300 metres away. Local attractions include Gundulic Square, Rector’s Palace and Church of St. Blaise. Other points of interest are Dubrovnik City Hall, Luza Square and Ragusinum College. This luxury 18th-century Baroque hotel offers elegant rooms and comfortable accommodation. It combines a convenient location with modern services, thus becomes a perfect choice for business and leisure travellers alike. The rooms are fitted with hand-woven rugs on dark oak floors, high beamed ceilings, marble staircases and classic architecture. As most of the Game of Thrones fans know, the Old Town of Dubrovnik was chosen for the role of the King’s Landing, after the crew had been forced to replace their previous Maltese location from the Season 1. As the filming in Dubrovnik started, the film crew openly admitted that they couldn’t have found a more suitable location to depict the capital of the Seven Kingdoms from the G.R.R. Martin’s books than Dubrovnik. Dubrovnik indeed provides ideal natural settings for King’s Landing, and you will realise this, once you get the chance to stroll around its cobbled streets. Apart from King’s Landing, you will also be able to recognise some other locations from the series, such as the magical town of Qarth. The tour starts at Pile Gate and last approximately two and a half hours. It would include the tour around the locations within and around the Old Town of Dubrovnik. 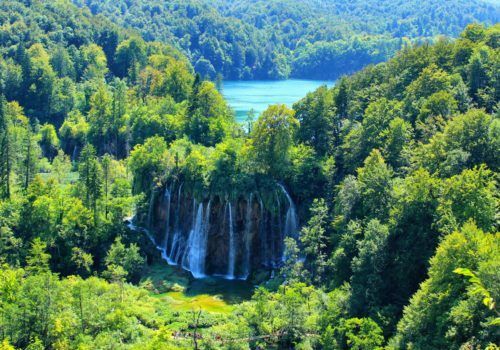 Today you’ll drive to the stunning Plitvice Lakes. It’s known for a chain of lakes, joined by beautiful waterfalls, that extends into a limestone canyon. Walkways and hiking trails wind around and across the water and provide the ultimate retreat from busy life. You’ll stay at a beautiful hotel situated in the heart of the National Park, only a couple of steps away from the Big Waterfall and the boat dock on Lake Kozjak. It is designed as an old traditional village, with traditional elements of Lika’s architecture. This family-run resort provides exceptional experience through its rooms and suites, along with a restaurant and a wide range of additional services. As part of Ethno Houses, unforgettable atmosphere creates a rich culinary choice of Croatian cuisine and the best Croatian wines in impressive wooden house ambience and warmth of restaurant for its guests. Today you’ll drive to Split, a town on Croatia’s Dalmatian Coast, renowned for beaches and the fortresslike Diocletian’s Palace, built by the Roman emperor in the 4th century. Split is a traditional city where you’ll find many stunning courtyards and galleries as well as beautiful architecture. You’ll have two days to explore the area. Today on a private tour, you will leave the everyday world and step into the realm of one of the greatest fantasy epics of all time, as you immerse yourself into the drama and intrigue that is Game of Thrones. An enthralling experience that will inspire you at every turn and leave you in awe. Start the tour at Diocletian’s Palace in the very heart of Split, built in the glory of Ancient Rome and feel the blood of the dragon pulse through your veins. The Roman palace was constructed by Emperor Diocletian, it is a UNESCO World Heritage site and has been a high point for world travellers for well over a thousand years, sparking the imagination of its natives, conquerors and guests – much like the cast of Game of Thrones and their crew. Daenerys fought the slave-owner overlords the Mereen and Yunkai with her faithful Unsullied within these very walls, only to return to Westeros as the victorious queen. Afterward, you will travel to the suburban town of Kastela where a medieval castle was built by Benedictine nuns and his environment was converted to Braavos, city by the sea toward which Arya Stark travelled at the end of the fourth season. Next stop is Klis Fortress, an ancient stronghold built upon stone cliffs atop of the City of Split, a structure that has been the epicentre to some of Croatia’s most legendary struggles throughout history. In recent years, Klis Fortress has found a new role: as the perfect filming location for Danaerys’s stronghold. Once you are there, looking down upon the scenery from the top of the hill, you will feel the sheer power of the mighty Targaryens. You will also visit a quarry which served as a real-world backdrop for an intense battle in the fourth season of Game of Thrones. Your tour concludes at Zrnovnica, once the home to a great number of grain mills, many of which have disappeared since medieval times, but those that survived the test of time have been meticulously restored and are a sight to behold. You will recognise this area as the place where Danaerys’s trusted handmaid and interpreter Missandei had her bathing scene. Here you will enjoy the traditional Croatian culinary delight of peka – a dish grilled under the bell – fresh, homemade bread, local wines and much more.